Outside of the English-speaking peoples the nineteenth century witnessed the rise and triumphant progress of three great tragic actresses. The first two of these–Rachel Felix and Sarah Bernhardt–were of Jewish extraction; the third, Eleanor Duse, is Italian. All of them made their way from pauperism to fame; but perhaps the rise of Rachel was the most striking. In the winter of 1821 a wretched peddler named Abraham–or Jacob– Felix sought shelter at a dilapidated inn at Mumpf, a village in Switzerland, not far from Basel. It was at the close of a stormy day, and his small family had been toiling through the snow and sleet. The inn was the lowest sort of hovel, and yet its proprietor felt that it was too good for these vagabonds. He consented to receive them only when he learned that the peddler’s wife was to be delivered of a child. That very night she became the mother of a girl, who was at first called Elise. So unimportant was the advent of this little waif into the world that the burgomaster of Mumpf thought it necessary to make an entry only of the fact that a peddler’s wife had given birth to a female child. There was no mention of family or religion, nor was the record anything more than a memorandum. Under such circumstances was born a child who was destined to excite the wonder of European courts–to startle and thrill and utterly amaze great audiences by her dramatic genius. But for ten years the family–which grew until it consisted of one son and five daughters–kept on its wanderings through Switzerland and Germany. Finally, they settled down in Lyons, where the mother opened a little shop for the sale of second-hand clothing. The husband gave lessons in German whenever he could find a pupil. The eldest daughter went about the cafes in the evening, singing the songs that were then popular, while her small sister, Rachel, collected coppers from those who had coppers to spare. Although the family was barely able to sustain existence, the father and mother were by no means as ignorant as their squalor would imply. The peddler Felix had studied Hebrew theology in the hope of becoming a rabbi. Failing this, he was always much interested in declamation, public reading, and the recitation of poetry. He was, in his way, no mean critic of actors and actresses. Long before she was ten years of age little Rachel–who had changed her name from Elise–could render with much feeling and neatness of eloquence bits from the best-known French plays of the classic stage. The children’s mother, on her side, was sharp and practical to a high degree. She saved and scrimped all through her period of adversity. Later she was the banker of her family, and would never lend any of her children a sou except on excellent security. However, this was all to happen in after years. When the child who was destined to be famous had reached her tenth year she and her sisters made their way to Paris. For four years the second-hand clothing-shop was continued; the father still taught German; and the elder sister, Sarah, who had a golden voice, made the rounds of the cafes in the lowest quarters of the capital, while Rachel passed the wooden plate for coppers. One evening in the year 1834 a gentleman named Morin, having been taken out of his usual course by a matter of business, entered a BRASSERIE for a cup of coffee. There he noted two girls, one of them singing with remarkable sweetness, and the other silently following with the wooden plate. M. Morin called to him the girl who sang and asked her why she did not make her voice more profitable than by haunting the cafes at night, where she was sure to meet with insults of the grossest kind. M. Morin gave her his address and said that he would arrange to have her meet a friend who would be of great service to her. On the following day he sent the two girls to a M. Choron, who was the head of the Conservatory of Sacred Music. Choron had Sarah sing, and instantly admitted her as a pupil, which meant that she would soon be enrolled among the regular choristers. The beauty of her voice made a deep impression on him. “I can recite poetry,” was the reply. Rachel readily consented. She had a peculiarly harsh, grating voice, so that any but a very competent judge would have turned her away. But M. Choron, whose experience was great, noted the correctness of her accent and the feeling which made itself felt in every line. He accepted her as well as her sister, but urged her to study elocution rather than music. She must, indeed, have had an extraordinary power even at the age of fourteen, since not merely her voice but her whole appearance was against her. She was dressed in a short calico frock of a pattern in which red was spotted with white. Her shoes were of coarse black leather. Her hair was parted at the back of her head and hung down her shoulders in two braids, framing the long, childish, and yet gnome-like face, which was unusual in its gravity. While uttering the thrilling tale the thin face seemed to lengthen with horror, the small, deep-set black eyes dilated with a fixed stare as though she witnessed the harrowing scene; and the deep, guttural tones, despite a slight Jewish accent, awoke a nameless terror in every one who listened, carrying him through the imaginary woe with a strange feeling of reality, not to be shaken, off as long as the sounds lasted. Even yet, however, the time had not come for any conspicuous success. The girl was still so puny in form, so monkey-like in face, and so gratingly unpleasant in her tones that it needed time for her to attain her full growth and to smooth away some of the discords in her peculiar voice. All the talent in the world, especially when continually applied to the same dramatic works, will not satisfy continually the hearer. What pleases in a great actor, as in all arts that appeal to the imagination, is the unforeseen. When I am utterly ignorant of what is to happen, when I do not know, when you yourself do not know what will be your next gesture, your next look, what passion will possess your heart, what outcry will burst from your terror- stricken soul, then, indeed, I am willing to see you daily, for each day you will be new to me. To-day I may blame, to-morrow praise. Yesterday you were all-powerful; to-morrow, perhaps, you may hardly win from me a word of admiration. So much the better, then, if you draw from me unexpected tears, if in my heart you strike an unknown fiber; but tell me not of hearing night after night great artists who every time present the exact counterpart of what they were on the preceding one. It was at the Theatre Francais that she won her final acceptance as the greatest of all tragedians of her time. This was in her appearance in Corneille’s famous play of “Horace.” She had now, in 1838, blazed forth with a power that shook her no, less than it stirred the emotions and the passions of her hearers. The princes of the royal blood came in succession to see her. King Louis Philippe himself was at last tempted by curiosity to be present. Gifts of money and jewels were showered on her, and through sheer natural genius rather than through artifice she was able to master a great audience and bend it to her will. She had no easy life, this girl of eighteen years, for other actresses carped at her, and she had had but little training. The sordid ways of her old father excited a bitterness which was vented on the daughter. She was still under age, and therefore was treated as a gold-mine by her exacting parents. At the most she could play but twice a week. Her form was frail and reed-like. She was threatened with a complaint of the lungs; yet all this served to excite rather than to diminish public interest in her. The newspapers published daily bulletins of her health, and her door was besieged by anxious callers who wished to know her condition. As for the greed of her parents, every one said she was not to blame for that. And so she passed from poverty to riches, from squalor to something like splendor, and from obscurity to fame. Much has been written about her that is quite incorrect. She has been credited with virtues which she never possessed; and, indeed, it may be said with only too much truth that she possessed no virtues whatsoever. On the stage while the inspiration lasted she was magnificent. Off the stage she was sly, treacherous, capricious, greedy, ungrateful, ignorant, and unchaste. With such an ancestry as she had, with such an early childhood as had been hers, what else could one expect from her? Mr. Vandam relates among other anecdotes about her that one evening she dined at the house of Comte Duchatel. The table was loaded with the most magnificent flowers; but Rachel’s keen eyes presently spied out the great silver centerpiece. Immediately she began to admire the latter; and the count, fascinated by her manners, said that he would be glad to present it to her. She accepted it at once, but was rather fearful lest he should change his mind. She had come to dinner in a cab, and mentioned the fact. The count offered to send her home in his carriage. Rachel had a curious way of asking every one she met for presents and knickknacks, whether they were valuable or not. She knew how to make them valuable. Once in a studio she noticed a guitar hanging on the wall. She begged for it very earnestly. As it was an old and almost worthless instrument, it was given her. A little later it was reported that the dilapidated guitar had been purchased by a well- known gentleman for a thousand francs. The explanation soon followed. Rachel had declared that it was the very guitar with which she used to earn her living as a child in the streets of Paris. As a memento its value sprang from twenty francs to a thousand. It has always been a mystery what Rachel did with the great sums of money which she made in various ways. She never was well dressed; and as for her costumes on the stage, they were furnished by the theater. When her effects were sold at public auction after her death her furniture was worse than commonplace, and her pictures and ornaments were worthless, except such as had been given her. She must have made millions of francs, and yet she had very little to leave behind her. Some say that her brother Raphael, who acted as her personal manager, was a spendthrift; but if so, there are many reasons for thinking that it was not his sister’s money that he spent. Others say that Rachel gambled in stocks, but there is no evidence of it. The only thing that is certain is the fact that she was almost always in want of money. Her mother, in all probability, managed to get hold of most of her earnings. Much may have been lost through her caprices. One instance may be cited. She had received an offer of three hundred thousand francs to act at St. Petersburg, and was on her way there when she passed through Potsdam, near Berlin. The King of Prussia was entertaining the Russian Czar. An invitation was sent to her in the shape of a royal command to appear before these monarchs and their guests. For some reason or other Rachel absolutely refused. She would listen to no arguments. She would go on to St. Petersburg without delay. This brings us to one phase of Rachel’s nature which is rather sinister. She was absolutely hard. She seemed to have no emotions except those which she exhibited on the stage or the impish perversity which irritated so many of those about her. She was in reality a product of the gutter, able to assume a demure and modest air, but within coarse, vulgar, and careless of decency. Yet the words of Jules Janin, which have been quoted above, explain how she could be personally very fascinating. In all Rachel’s career one can detect just a single strand of real romance. It is one that makes us sorry for her, because it tells us that her love was given where it never could be openly requited. During the reign of Louis Philippe the Comte Alexandre Walewski held many posts in the government. He was a son of the great Napoleon. His mother was that Polish countess who had accepted Napoleon’s love because she hoped that he might set Poland free at her desire. But Napoleon was never swerved from his well- calculated plans by the wish of any woman, and after a time the Countess Walewska came to love him for himself. It was she to whom he confided secrets which he would not reveal to his own brothers. It was she who followed him to Elba in disguise. It was her son who was Napoleon’s son, and who afterward, under the Second Empire, was made minister of fine arts, minister of foreign affairs, and, finally, an imperial duke. Unlike the third Napoleon’s natural half-brother, the Duc de Moray, Walewski was a gentleman of honor and fine feeling. He never used his relationship to secure advantages for himself. He tried to live in a manner worthy of the great warrior who was his father. As minister of fine arts he had much to do with the subsidized theaters; and in time he came to know Rachel. He was the son of one of the greatest men who ever lived. She was the child of roving peddlers whose early training had been in the slums of cities and amid the smoke of bar-rooms and cafes. She was tainted in a thousand ways, while he was a man of breeding and right principle. She was a wandering actress; he was a great minister of state. What could there be between these two? What she meant was, of course, that Walewski’s breeding, his dignity and uprightness, might be regarded only as a temporary repose for the impish, harsh-voiced, infinitely clever actress. Of course, it was all this, but we should not take it in a mocking sense. Rachel looked up out of her depths and gave her heart to this high-minded nobleman. He looked down and lifted her, as it were, so that she could forget for the time all the baseness and the brutality that she had known, that she might put aside her forced vivacity and the self that was not in reality her own. It is pitiful to think of these two, separated by a great abyss which could not be passed except at times and hours when each was free. But theirs was, none the less, a meeting of two souls, strangely different in many ways, and yet appealing to each other with a sincerity and truth which neither could show elsewhere. The end of poor Rachel was one of disappointment. Tempted by the fact that Jenny Lind had made nearly two million francs by her visit to the United States, Rachel followed her, but with slight success, as was to be expected. 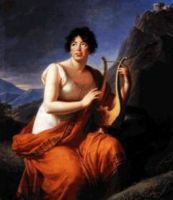 Music is enjoyed by human beings everywhere, while French classical plays, even though acted by a genius like Rachel, could be rightly understood only by a French- speaking people. Thus it came about that her visit to America was only moderately successful. She returned to France, where the rising fame of Adelaide Ristori was very bitter to Rachel, who had passed the zenith of her power. She went to Egypt, but received no benefit, and in 1858 she died near Cannes. The man who loved her, and whom she had loved in turn, heard of her death with great emotion. He himself lived ten years longer, and died a little while before the fall of the Second Empire.